Raible Designs | The Trifecta 2013! The last time I pulled off a Trifecta (3 ski resorts in 3 days), it was in 2010. I hadn't met Trish yet and DU Hockey had started their we're terrible in the playoffs streak. Last weekend, I decided to go for it again, this time with fiancé and kids in tow. We originally intended to ski Friday afternoon, but Abbie had an important "Mayor Election" at school and we were unable to leave early. By the time we arrived in Winter Park, the lifts were closed. 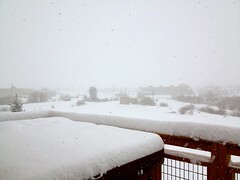 When we drove to Steamboat on Saturday, we only intended to ski 2 days. 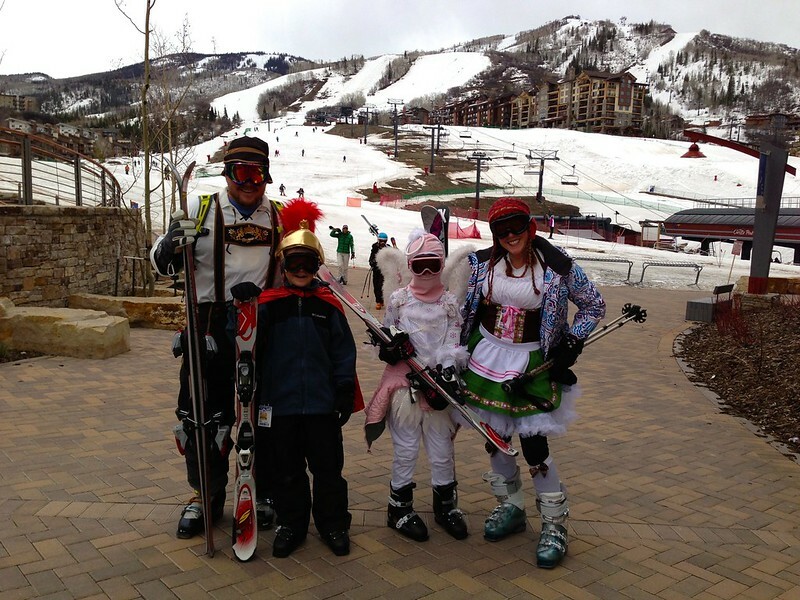 We dressed up in our outfits and got ready for the warm, mashed-potato conditions on Steamboat's closing weekend. The conditions weren't great, so we only skied for a couple hours. Then we hung out with Trish's friends (Jenn and Todd) for the rest of the afternoon, swimming and frolicking with our kids like good parents do. On Sunday, we woke up and checked the ski report. While Steamboat did get 8" of fresh powder, Copper had 13 inches! So we packed up the car, puppies, and kids and drove 2 hours to Copper. When we arrived, we weren't disappointed. The kids were loving it and the conditions were great. When we stopped for lunch, I was a bit disappointed that our ski weekend was about to end. Then I checked the Winter Park forecast, was pleasantly surprised, and asked "Hey, kids - should we complete the Trifecta and skip school tomorrow?" Of course, they said "YES" and our plans were set. We did a couple more runs, listened to some good live music at the base, then headed to our mountain views in Winter Park. Sunday night is when the fun started. I didn't call the kids in sick for school, nor did I call in sick for my current client. I simply told them both we had a unique opportunity to complete a Trifecta and the snow was too good to leave. 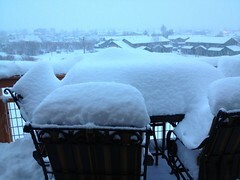 Monday morning we woke up to 7" of fresh powder and by the time we got to Mary Jane, it was knee-deep. The runs were unbelievable. I skied several bump runs on Mary Jane without ever hitting bottom. It snowed hard all day long and by 2pm, they'd closed Berthoud Pass. This meant we had to stay another night. Some friends were stranded, so we offered them to stay with us and we enjoyed a nice evening reminiscing about all the fluffy snow and face shots. The first photo below is the snow accumulation on Monday morning; the second is from Monday at Happy Hour. 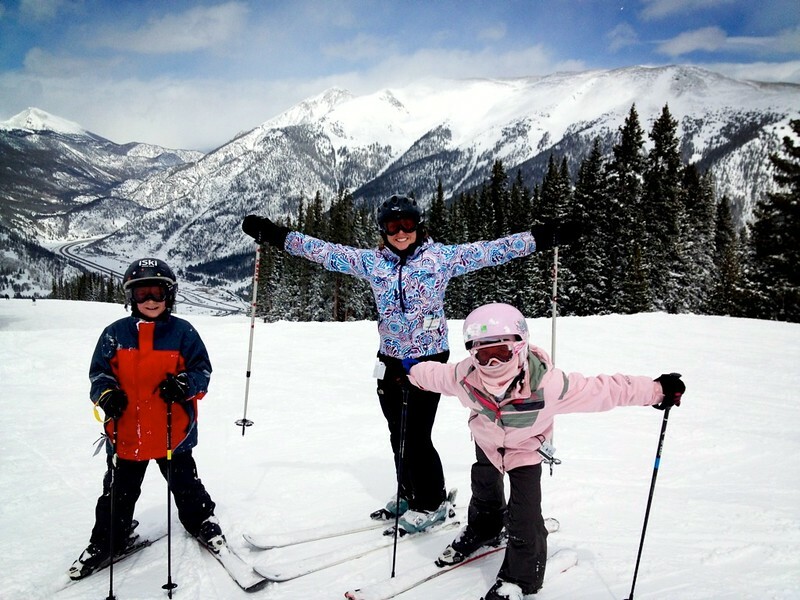 Skiing a Trifecta with my family seems like a perfect way to end the ski season. However, it's been snowing all week and I've had several powder runs since Monday. It's snowed 37 inches in the past 7 days and there's more snow in the forecast this weekend. Winter Park's Springtopia starts tomorrow. Live music, fresh powder, the Nuggets in the playoffs and a place at the base with good friends. The fun ain't over yet!